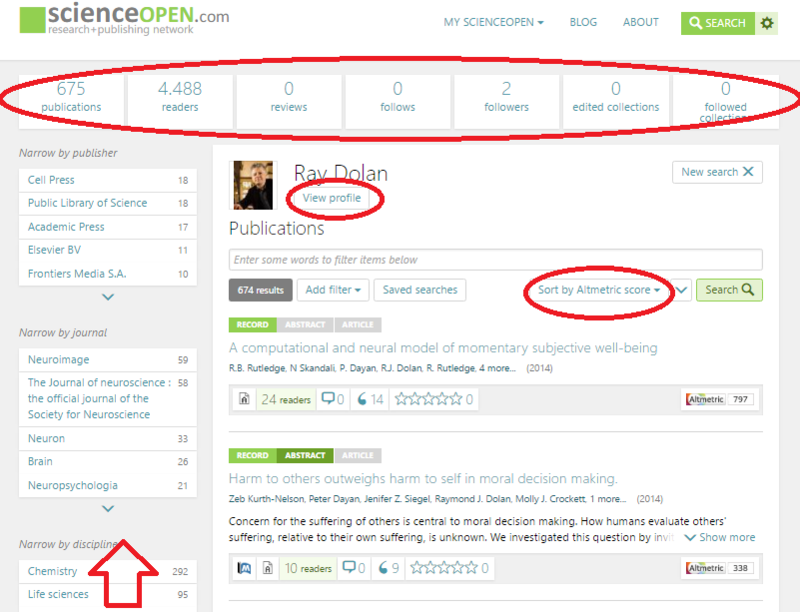 On top of our search and discovery platform ScienceOpen has built a ‘social networking’ layer to allow researchers to interact with each other and with the content on our site. We don’t see ourselves so much as a social platform like Facebook or ResearchGate, but more as a professional community space for researchers to exchange knowledge and progress their research field in the open, and receive credit for doing so. But what are the key features needed for any modern research platform like this? We track the output from 16 million authors, via our contextual metadata network – not just those who have created a profile on our site. So if you want drill down on the researcher data, this is it! You can sort a researcher’s papers by Altmetric score, usage, citations and more to better understand their work. But you can also create a profile, follow other users, share and connect. Unlike other platforms, we don’t expect you to manually upload your papers. We automate this via ORCID integration instead. I mean, it’s 2017, this just makes sense. Platforms such as ResearchGate and Academia.edu rely on individuals to manually upload their research, often requiring a lot of effort and time. Furthermore, there is a total loss of legal certainty, as often it is copyrighted publisher versions which are uploaded onto the platforms, and integrated into their data systems. © 2019 ScienceOpen – All rights reserved.